For those new to our writings, we touch on the most pertinent Financial “stuff” along with a video that has even more specialized details of the latest month as well as this post. Be sure to Catch that Catch up provision ! Those turning 50/55 years young this year should contact your employer (if applicable) to make sure you are enrolled and receiving maximum benefits. 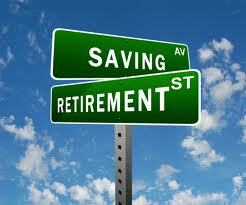 With taxes being more prevalent (being PC here) since the tax payers relief act sunset, every savings counts! 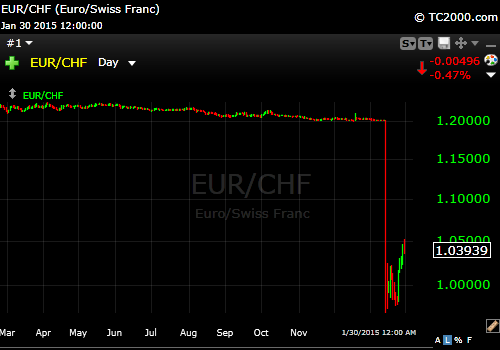 The pressure of the worlds lower rates were too much for the Swiss to take. 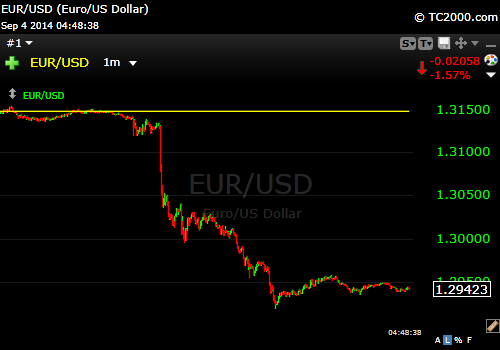 After promising they would hold the peg to the Euro, in sudden turn around fashion they let the peg go. A quick view of this chart shows the pain that occurred for many on the wrong side of this exchange. These concerns arising from the Swiss moves may have larger implications, not to worry, we are watching carefully. The underestimate of worlds lower rates on our US rate continues but not only ourselves, but almost all other. Rates have continued to fall even as our economy picks up steam. Another side effect, in addition to our Swiss comments above. Lower rates, a negative predictor of future economic growth in the past may not be giving the correct signal at this time. 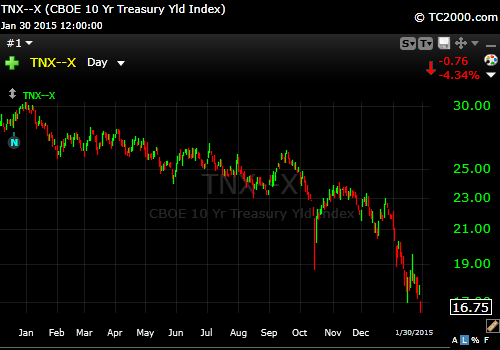 Time will tell, but we think these are artificially low and will normalize in the coming quarters. Read “Higher Rates” coming soon! Hope you are having a great start to the year! As a continuation of our first part series, U.S. Dollar, Down and Out, or Not to Worry? (Part One of A Series) we will expand on interest rates and their direct effect. Given the fact that, using our Bank of England example, certain governments have different objectives that others, (U.S.) Let’s take a look at the possible direct effects, again in our opinion. The U.S. Government is attempting to stimulate our economy by holding rates low. without much consideration to the level of the U.S. dollar against other foreign currencies. This helps the ailing housing market and also helps the financial centers, banks, become more profitable. Low interest rates help home owners refinance and purchase homes at a much more affordable monthly payment. Low interest rates are very profitable for financial centers as they loan at much higher rates than they borrow or lend at, thereby putting the wind at their back for profits. Our belief is there is an approximate finite pool of currency investors, and as disparity between country rates exist, the lower interest rate country currency will be pushed down, and the higher currency interest rate moved up, all other factors being equal. Next up, in our last part, longer term patterns.